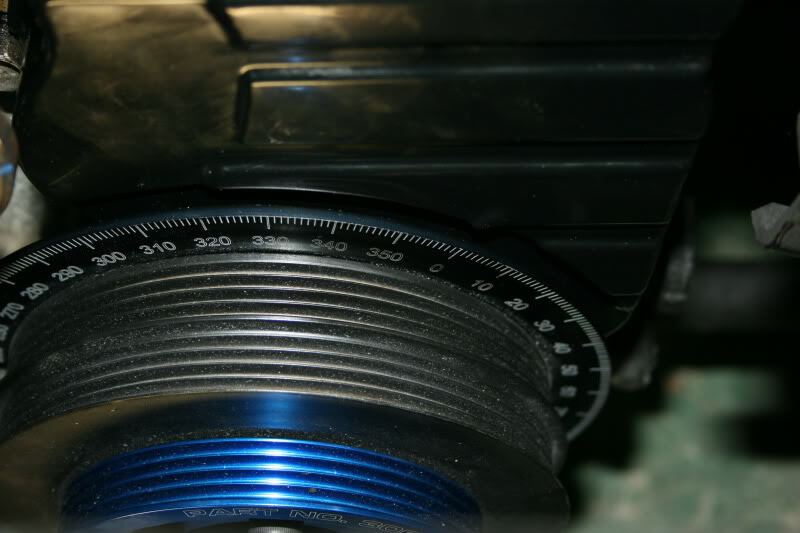 Since there is NO info anywhere on how to degree rb cams and the info that is out there is as clear as muddy water I decided that I would post a proper write up on how to degree your cams. Please note that I am using a ross metal jacket balancer with an integrated degree wheel, so the math isnt the same if you’re using a traditional degree wheel but IS applicable if you’re using the degree wheel which comes with some after market cam sprockets (my greddy gears came with a 360* wheel printed on a piece of paper). This is the most important step of the process, do this wrong and you might as well not do it at all or possibly bend some valves, so be FORWARNED! Remove all spark plugs before you start, else you’ll find its nearly impossible to get readings without a struggle. 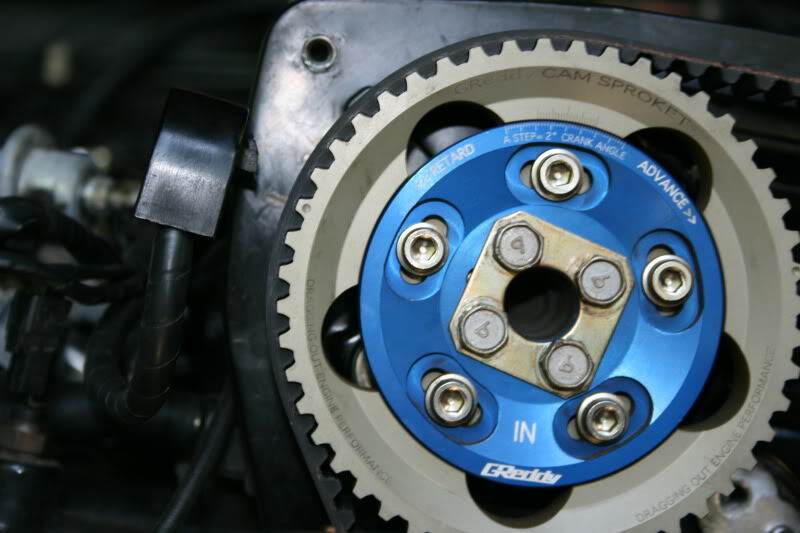 Crank the engine over by hand to the factory marked TDC using the notch on the lower timing cover as well as the marks on the cam gears on the timing cover backing plate. The cam lobes for both intake and exhaust should be facing outwards towards the fenders (cylinder 1). Next you’ll need to fashion a pointer out of the coat hanger wire, I chose to bolt my pointer to the power steering pump as it was a rigid surface out of the way of movement. You’ll want to adjust the pointer to read 0* on the crank, you’ll be most likely changing this later so it does not need to be exact. 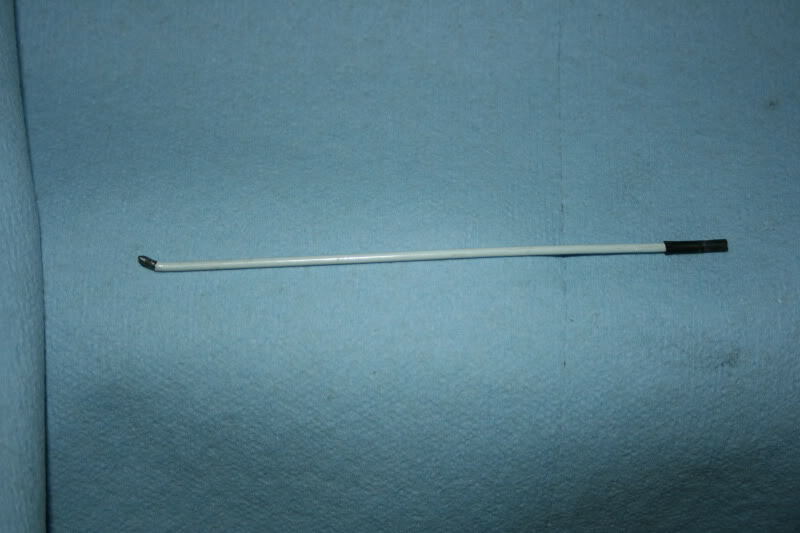 Pointer made out of a short length of coat hanger bent to shape; note a slight bend in the pointer as well as the sharpened point on the pointer for accuracy. 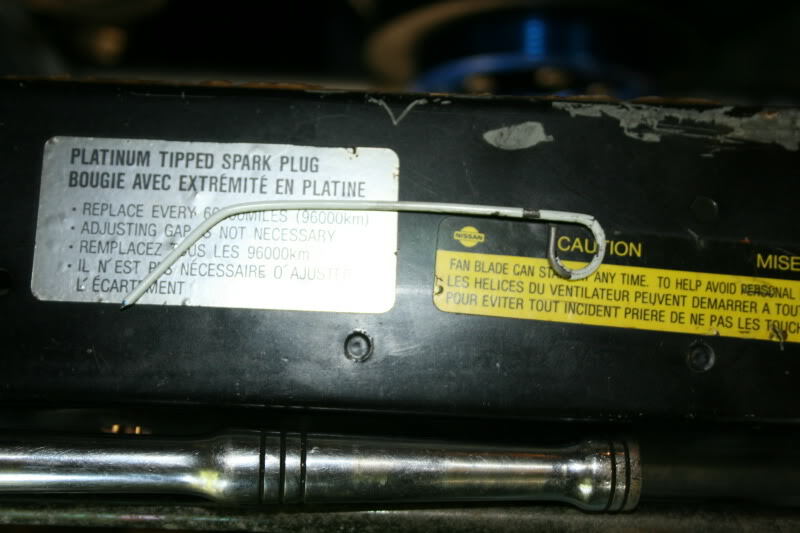 An alternate method of finding tdc is to stick a 1′ 3/8″ drive extension down the spark plug hole and by finding the ‘peak’ height of the extension one can find the almost exact tdc within a degree or two, this is useful when setting your crank pulley to 0*. Now you need to install your piston stop. These can be purchased commercially for around $5 or if you have a few parts laying around (or are cheap/broke) then you can fashion one from an old spark plug. I chose to make one as I am impatient and did not want to wait till later this week to have a piston stop so I made one from an old spark plug and an m10x1.5 thread pitch bolt…sparkplug body was tapped for m10x1.5 and the threads on the purchased bolt extended using a tap, one should tap all the way to the head to allow a jam nut to be used but bottoming out the bolt works just as well. 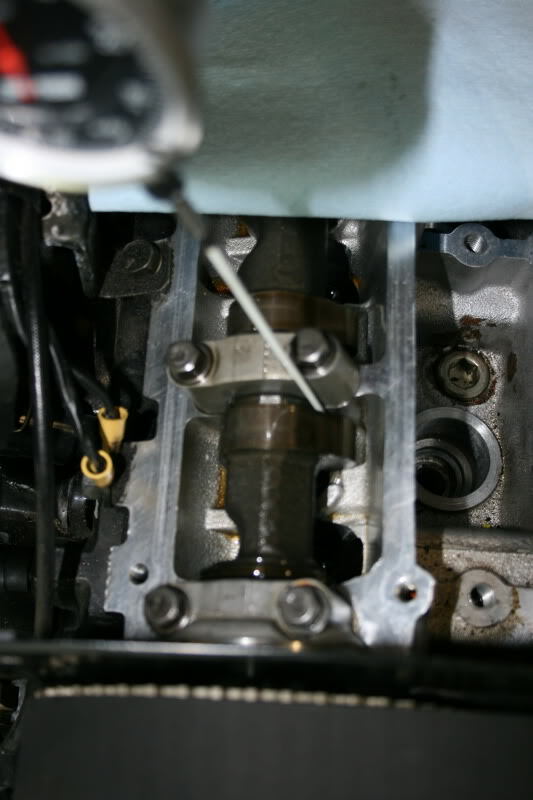 Before the piston stop bolt is installed you’ll need to turn the crank approx 60* BEFORE TDC, this will ensure that you’ll have enough travel to install the bolt into the bore without hitting the piston prematurely. Install the piston stop bolt to desired height (in my case bottomed out) and lock it down with a jam nut. Rotate the engine BACKWARDS (counter clockwise) by hand using a socket on a ratchet, eventually the piston will make contact with the stop…do this slowly and stop rotating when the piston stop is engaged; you do not want a nicked piston. To figure out what other degree we are looking for to ensure that we are at true TDC we simply subtract our first angle from 360. Rotate the engine now CLOCKWISE till the piston stop engages the piston; note the degree at which it rests at. Adjust the pointer so that it reads tdc properly, my pointer required just a slight nudge to be spot on, you may find that you’ll have to do the aforementioned process a few times to get your pointer lined up with true TDC. 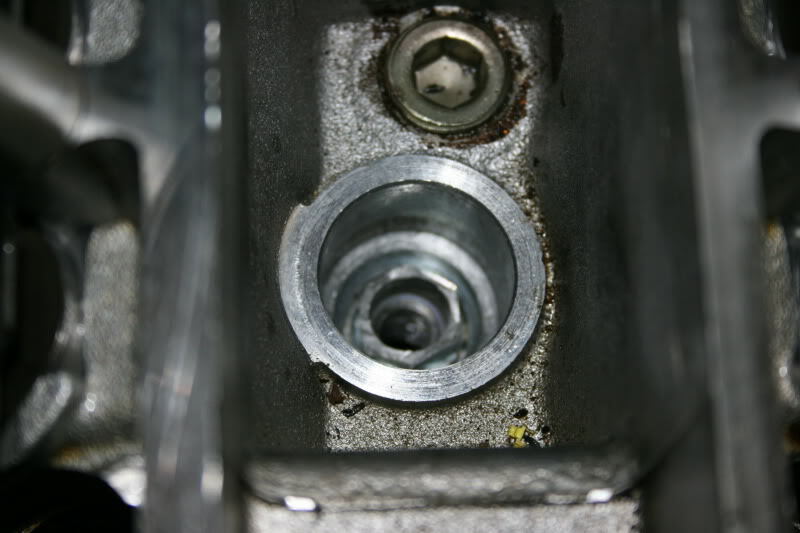 Remove the piston stop from the engine, FAILURE TO DO SO COULD RESULT IN DAMAGE TO THE PISTON IN PROCEDING STEPS! Once you’ve completed adjusting the pointer to true TDC you can proceed to step two. For this step you’ll need to make another special tool for the dial indicator to do its job, this is due to the lifter design of a cam on bucket setup. Since a dial indicator would normally rely on something pressing against it such as a rocker arm or crank run out we dont have the luxury of this with a cam on bucket setup. to get around this the dial indicator must be preloaded in order to induce a measureable change. 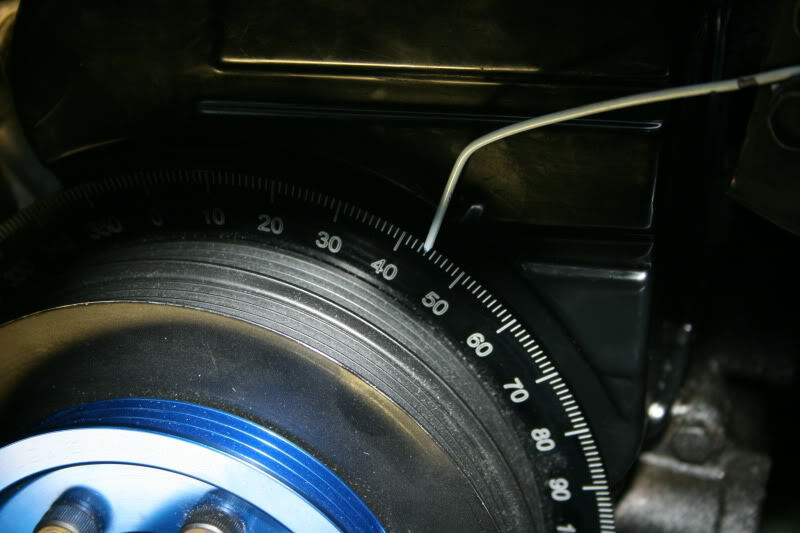 For both intake and exhaust measurements the dial indicator was preloaded to .5″ which gave good results and the ability to take measurements at several points during the cam’s phasing. Due to the space constraints you’ll need to fashion an extension rod from a coat hanger using a straight length (as straight as possible) and a small piece of shrink wrap. 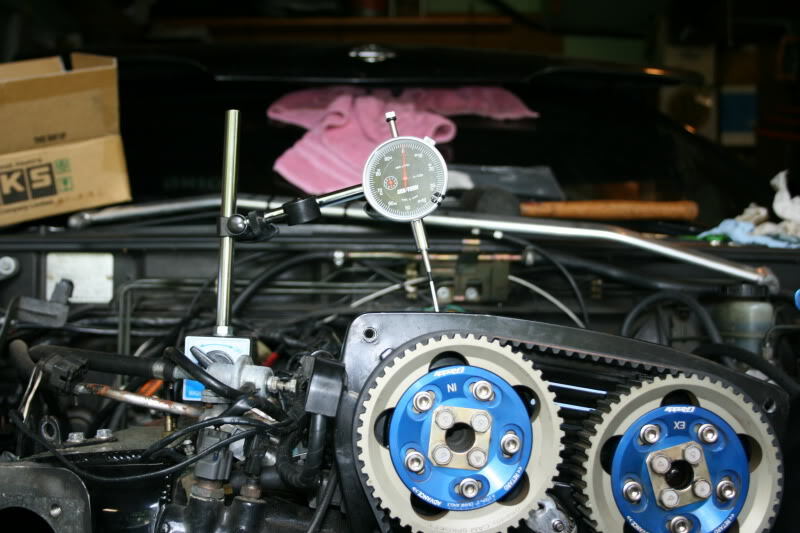 Most dial indicator tips can be removed from the dial indicator…you’ll need to do this. Coat hanger wire by its self is too small to fit into the dial indicator but once some shrinkwrap is place around it and heated you’ll find that it can be then screwed into the dial indicator resulting in a very tight fit and rather accurate extension. Be sure that you round and smooth th end of the extension so as not to mar the lifter surface. Here is where it begins to get fun, don’t be intimidated tho its really not that hard (well after you figure it out). You’ll need to mount your dial indicator so that the actuation rod is parallel to the valve stem, a good guide for this is the cam tower bolts as they are also parallel to the valve stem. Again as stated before be sure to preload the dial indicator before you mount it, do not have it set to ‘0’ or nothing will happen when you turn the crank… I used .5″ as preload which worked well I would not suggest anything lower. 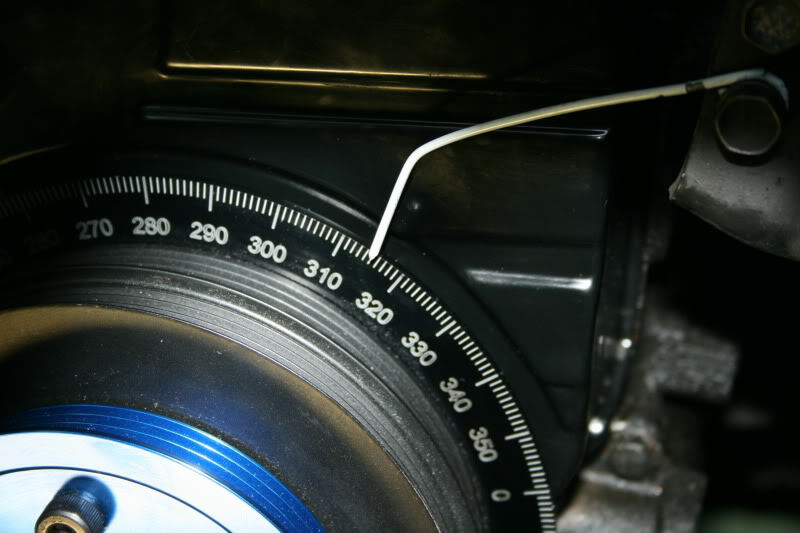 Make sure when placing the dial indicator rod that the tip does not get caught under the cam lobe…this is quite possibly the hardest part of the whole process. 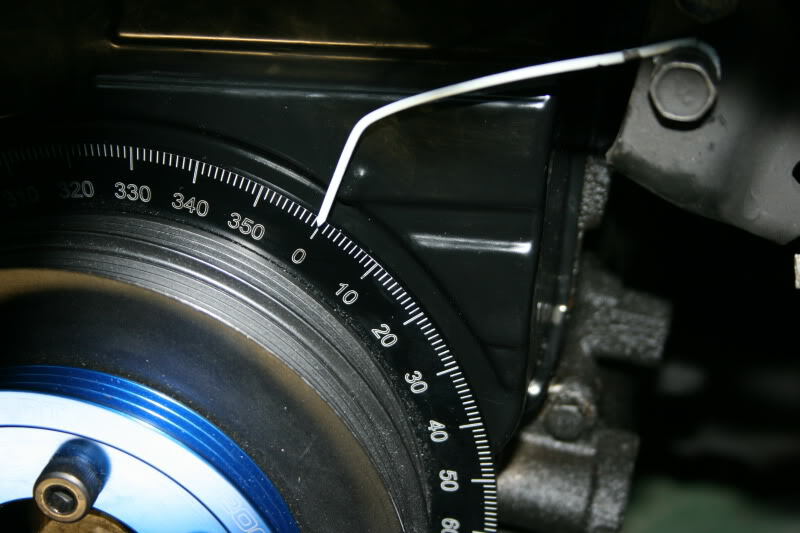 Once you have your indicator setup and ‘zeroed’ out (start with 0.50″ for example, not 0.513″) you are ready to begin. 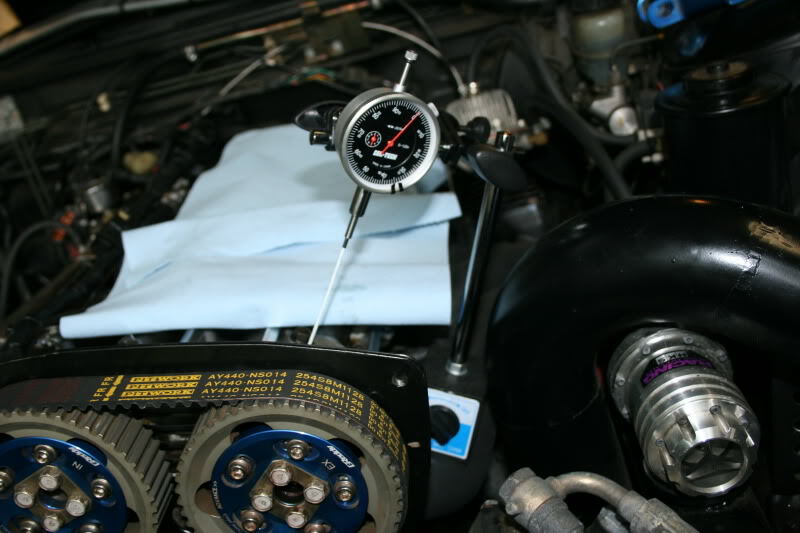 Begin by rotating the crank by hand CLOCKWISE while watching the intake cam lobe (cylinder 1) you will get to a point where the dial indicator will begin to move and DECREASE in measurement. Pick a nice round number such as 0.4″ or 0.3″ (I used 0.3″ for my measuring) as a reference value for finding the center line, it is best to use this value for both sides to avoid confusion. Eventually the dial indicator will reach a minimum an ‘bottom out’ at which point max lift has been reached. Continue turning clockwise and the dial indicator should increase and eventually reach your initial preload setting. Go around again this time watching the dial indicator and when it gets to your reference value (again in my case 0.30″) take note at what the degree reading on the wheel is, write this number down. Continue turning the crank till you reach max lift, again pay attention to the dial indicator and when it reaches your reference value again stop turning and record the number of degrees on the crank. 1) take both numbers and subtract them from 360.
example – my degree numbers from my measurements (might have been 0.40″ or 0.30″, i did several iterations but they all should come out the same regardless of choice of reference value). Find out from your cam card what the degree value ATDC for the intake cam should be, for my tomei pro cams the value was 115 so no adjustment needed! It is best to check several times to make sure that you are on the right track…when I checked my cams with different reference values they all yielded 115* atdc so I did not have to change my intake cam at all. You are now done with your intake cam. 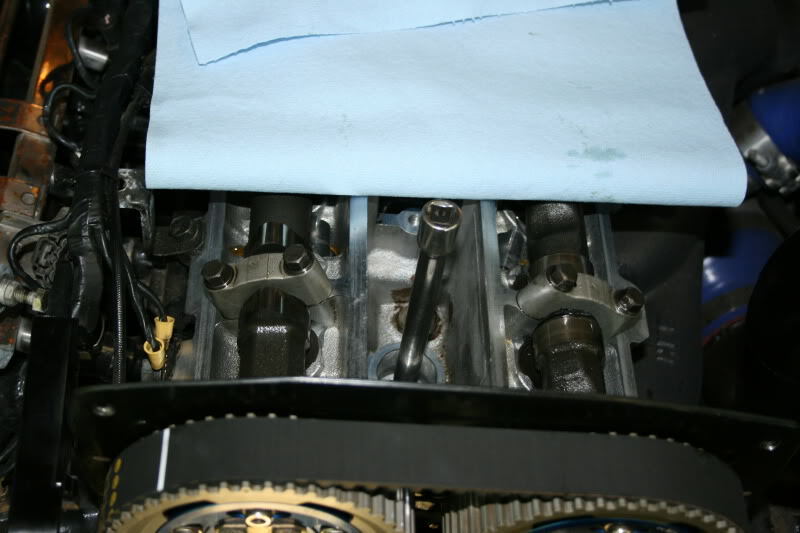 Step 3 – degreeing your exhaust cam. Setup for this step is the same as for the intake cam except that we are looking for degrees BTDC. Uh oh, we have a problem…tomei specifies the exhaust cam is spec’ed to 115 BTDC. There is a difference of 3* crank here between specified and what is shown. Since cam time is double that of the crank to get 3* crank we need 1.5* cam, and since this is advanced compared to what is specified we need to retard the cam 1.5* to get our 3* crank back. Exhaust cam is now in phase according to tomei. 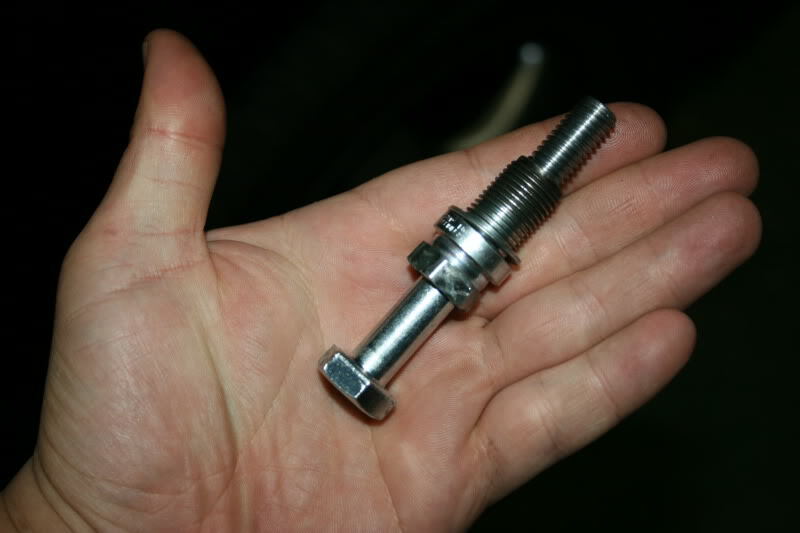 Remember to tighten the cam adjusting bolts temporarily while making adjustments and to torque to proper spec once adjustments are complete…you do not want your cams to slip as this can cause catastrophic damage to the engine. Remove the temporary pointer and be sure to reset your base ignition timing, depending how far out your cams were you may need to also retune the engine. If you’ve followed all the steps properly your engine should now be in complete time as per the cam manufacturers specifications and perhaps on your way to more power, better idle vacuum, and drivability.